How do I enable office tab in Microsoft Office? If Office Tab isn't showing in your PowerPoint, Word, or Excel document, try the steps below to enable. Note 2: 64 bit Office Tab installation package only for the 64 bit Microsoft Office 2010/2013. If you are using the Microsoft Office 2003 or 2007, you should choose to download the 32 bit Office Tab installation package. Go to Office Tab Center, you can enable or disable the specific tab feature. You can access Office Tab Center by double clicking on the Office Tab Center icon on your computer desk. You can also access by clicking Start>All Programs>Office Tab>Office Tab Center. To make sure the Enable Tabs for Word, Excel, PowerPoint, is checked. Click "OK" to close Office Tab Center. If the problem is still out there, please go to next step. In this case, I am going to use Microsoft Word 2010 for this troubleshooting. If there is no tab in Word, you should choose to access the Word Add-ins Manager to enable it manually. 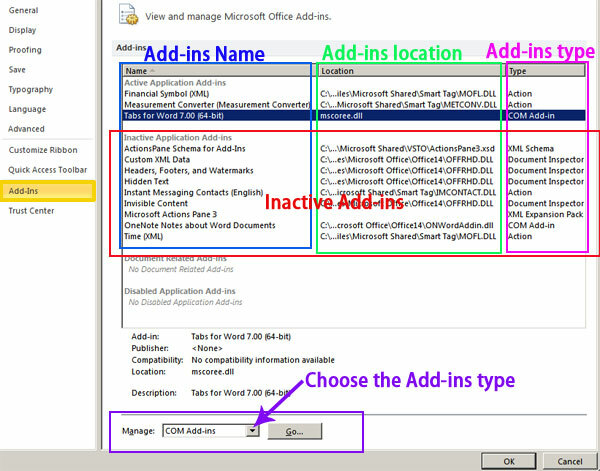 For Office 2010, Click File>Options>Add-Ins. For Office 2007, Click Office icon>Word Options>Add-ins. Note: if you are using Microsoft Office 2007, please make sure both the Tabs for Word 7.00 (32-bit) and Office Tab loader for Word are enabled. Why Office Tab will become disabled sometimes? That's because there are some other Office add-ins which is not compatible with Office Tab in your Office. In this case, you should try to disable some other Office add-ins which you don't need to use, and just keep Office Tab enabled.